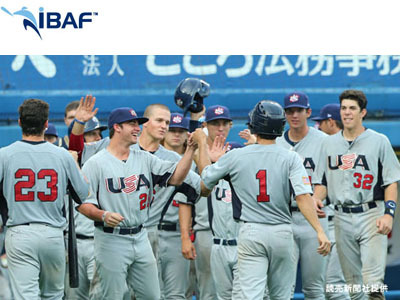 MATSUYAMA, Japan - A 50 minute rain delay turned the tides in the favor of the USA Baseball Collegiate National Team as it scored six times in its final four at-bats to take a 6-3 game one victory over Japan. Two Japanese errors led to three unearned Team USA runs. "It's a good start for us, but we know we have a long way to go," remarked manager Jim Schlossnagle. "We didn't panic after the first inning because we felt like we were having good at-bats against Osera and we just needed to get a timely hit. We felt like Luke Weaver was going to keep them under control." Luke Weaver (Florida State) surrendered just one run on four hits in four innings of work for Team USA. David Berg (UCLA) earned the win in relief after giving up a run on a hit, walking one and striking out two in two innings on the mound. Chris Diaz (Miami, Fla.) retired two of the three batters he faced in the seventh. Daniel Mengden (Texas A&M) was touched for an unearned run in his 1 1/3 innings, while Ryan Burr (Arizona State) struck out the side around a walk in the ninth to get his fourth save of the summer. Japan jumped out to an early lead in the first inning with a two-out rally. Kanji Kawai doubled to center and scored on a base hit up the middle from Ryutaro Umeno to give the Japanese a 1-0 lead. Team USA looked poised to tie the game in the top of the second as it loaded the bases with only one out. Cal State Fullerton's Matt Chapman became the CNT's first base runner with a base hit through the right side. Brad Zimmer (San Francisco) followed with a base hit and Sam Travis (Indiana) was hit by the pitch to load the bases. Japan starter Daichi Osera got a pair of strikeouts to leave the bases loaded. The rains came pouring down with one out in the top of the fifth. Fifty minutes later the team's returned to the field. Nine men came to the plate for Team USA in the sixth and four came around to score as it took a 4-1 lead. Michael Conforto (Oregon State) lined a single up the middle to open the inning and moved to third on a base hit from Kyle Schwarber (Indiana). Chapman lined a single into left field to tie the game at one. Zimmer dropped down a perfect sacrifice bunt, but the throw to first sailed into foul territory and both base runners came around to score for a 3-1 lead. With one out, Zimmer was standing on third. Grayson Greiner (South Carolina) grounded out to second to drive in Zimmer with the fourth run of the inning. Japan battled back to cut the lead to two in the seventh. Shogo Nakamura lead off the inning with a double and was standing on third with two outs. Ryo Miki reached on an infield single to drive in Japan's second run of the game to make it a 4-2 game. The Red, White and Blue wasted little time getting the run back and adding another as it pushed across two in the eighth to open up a 6-2 advantage. Travis led off the inning with a base hit to center. With one out, Austin Cousino (Kentucky) took a pitch off the shoulder to put two on. Alex Bregman (LSU) lined a single into left field with two outs. The ball skipped under the glove of the outfielder and both runners came home to score to make it a four-run lead. A one-out error in the eighth by Team USA turned into an unearned run for Japan, closing the gap to three. A single from Umeno followed the miscue, putting runners on the corners. Mengden looked like he got the ground ball he needed to get out of the inning, but Nakamura beat the relay to first to drive in the run that made it a 6-3 contest. Japan would get no closer as Burr closed the door in the ninth to secure Team USA's win. The Collegiate National Team takes a 1-0 lead in the USA vs. Japan Collegiate International Friendship Series. Game two is set for Sunday at 1 a.m. (ET)/2 p.m. (JST) at Matsuyama's Botchan Stadium. TCU's Brandon Finnegan will get the start for Team USA.